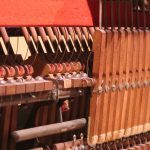 What do good piano tuner’s use? 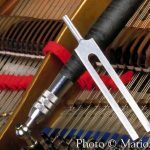 This lady says she just uses an A440 tuning fork to get the piano in tune. I have seen another tuner use a digital instrument. What is better? Of course, my husband is thinking he can tune the piano with the right instruments… Hubby LOVES any excuse to buy more tools. 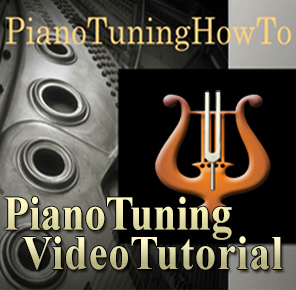 Most professional tuners will use a tuning fork (A=440), then set the temperament by ear, then work their way across the instrument. It’s an acquired skill, you don’t just "pick it up". If you husband insists on tuning his own piano, a $20 digital tuner won’t do. He will need a "strobe" tuner. Peterson makes some of the best, most have been turned into "virtual strobe tuners." The Peterson StroboFlip would be a good choice. More important than the tuner will be a quality tuning hammer. I use a Hale hammer. Again, don’t skimp on quality. Expect to pay $75 or more for a good hammer with a #2 star head. 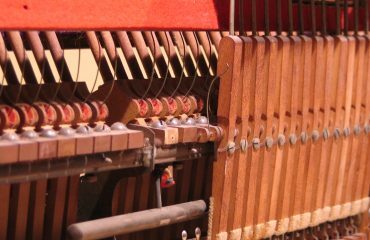 The grip MUST be comfortable in the hand, and the head must NOT slip on the tuning pins. Next, a temperament felt … it’s a thick felt mute about three feet long. Add some rubber mutes. With a stick is often easier to use than plain rubber wedges. 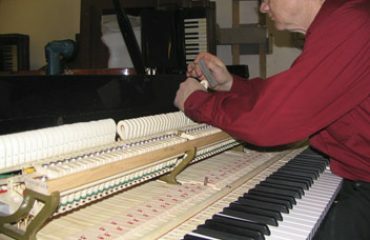 A capstain wrench is very useful for pushing the temperament strip between the strings. 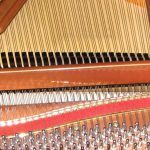 MOST important … before anything else, get a copy of Arthur Reblitz’ book "Piano Servicing, Tuning, and Rebuilding, Second Edition: For the Professional, the Student, and the Hobbyist "
The classic way to do it is to hear the "beats". 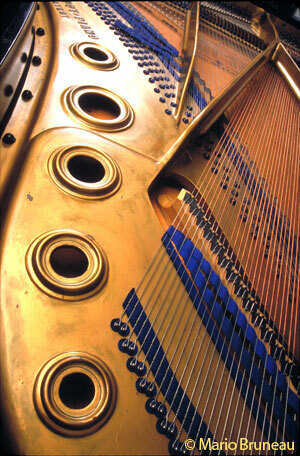 Really skilled piano tuners need nothing more than a tuning fork and a metronome. When you sustain two notes with some slight dissonance, you can hear "beats" which will happen at a certain number of beats per second. This is because a piano is actually always intentionally "out of tune". It’s called equal temperament. Musical intervals are actually not meant to be perfectly evenly spaced apart from each other (100 cents between each half step). I’m a stringed player and know that to be in tune, a third should be slightly lower and a fifth should be slightly higher etc while I’m playing with other string players who are also adjusting. 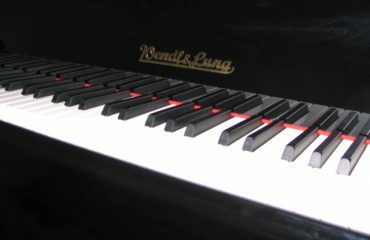 When we play with a piano we have to sync with the equal temperament, even though it’s not truly right. Anyway, maybe you didn’t need all that. I think the problem with tuning a piano with a digital tuner is that it just doesn’t produce as good results as a really good ear. If you’re looking at a tuner and tuning to the swaying needle, while I can’t argue with science, from experience it just doesn’t sound as pure. I’ve tuned my own piano by having the digital tuner play a sustained beep while I tune the string to that. This drove me crazy. A sustained piano note is so much more complex than a beep. I kept tuning it up and down trying to get it perfect, then I’d tune the corresponding two strings similarly and they weren’t perfectly consonant with each other. I was taught to only ever use the tuner in the first octave tuned, also called the temperament octave. My teacher told me the reason was that equal temperament, which is how pianos are tuned, isn’t necessarily perfect intervals. Electronic tuners don’t normally have the allowance for the slightly different intervals. 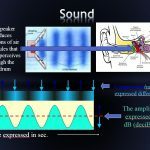 It’s better for the tuner to learn to rely on the ear instead of the machine. I’m glad your husband is excited and thinks he can learn, but it’s not a simple mechanical process. Unless he’s naturally gifted, he’s in for a LOT of intense ear training in order to distinguish the "beats". I’d strongly recommend picking him up a used copy of Arthur Reblitz’s "Piano Servicing, Tuning, and Rebuilding". It’s in its second edition, and is considered one of several "standard" references. As for the tools, there are cheap ones on e-Bay, but this is a tool that gives you what you pay for. The muting wedges and temperament felt aren’t very expensive, but the tuning wrench or hammer runs a bit more. My personal preference is for a Hale brand telescoping handle. It has a removable head, although the #2 tip is the most common size. A good quality strobe tuner is going to start in the neighborhood of about $300, and go up from there. 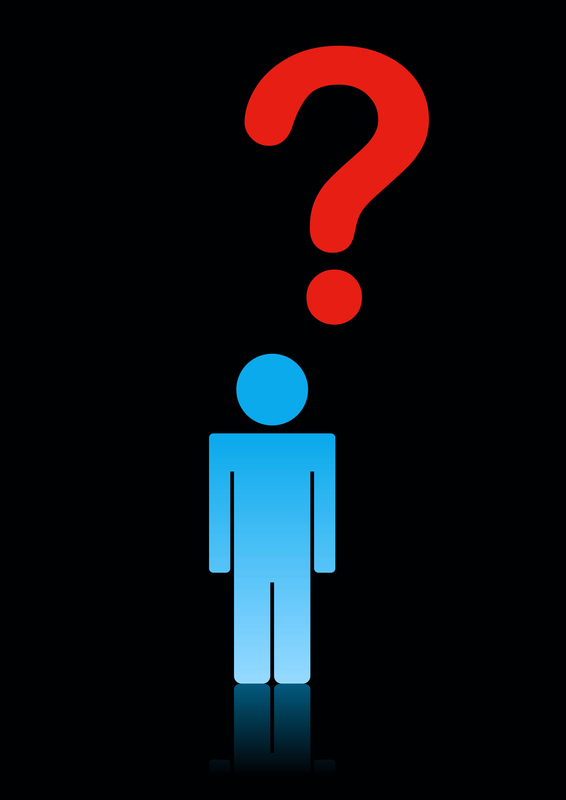 If he really wants to learn, why not ask your tuner if your husband can sit in for a bit on your piano’s next tuning? Just watching and listening is going to give him a good idea of what he’s in for, and whether he’s got a natural ear for it. The piano tuner’s task is not an easy one. 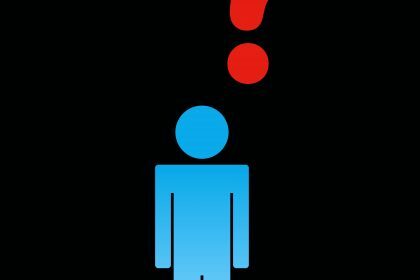 He must be, both, the engineer, AND, the technician at the same time. 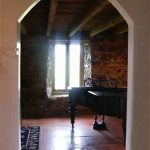 The piano tuner must possess all of these qualities.